On a brisk November morning, a couple dedicated NJ Osprey Project volunteers joined myself and CWF Biologist Larissa Smith to install an osprey platform on the coastal saltmarsh of New Jersey. The new platform was installed to replace a very old and unstable platform that fell this summer. The new structure is more than twice the size of the old one and will give the nesting pair, who return in the spring, a much more resilient nest site. As you can see from the video above, it takes a bit of strength to raise up a 16′ tall wood nest platform. We decided to slow it down when WCC Volunteer, Wayne R. gives it a final push. Around 75% of the population in New Jersey nests on these “man-made” nest platforms, which were originally installed in the early 1970s to help boost the early recovery efforts, post-DDT. Maintenance of these platforms is critical to the long term stability of nesting ospreys in New Jersey. Several of our volunteers have been out conducting maintenance on platforms throughout S. Jersey. If you know of a platform that needs repairs, please let us know and we will do everything to help repair it. If you’d like to volunteer to help maintain platforms or donate to support this project, please email me or visit our website to learn more. Volunteers (L to R) Wayne R, Matt T. and Larissa Smith, CWF Biologist. 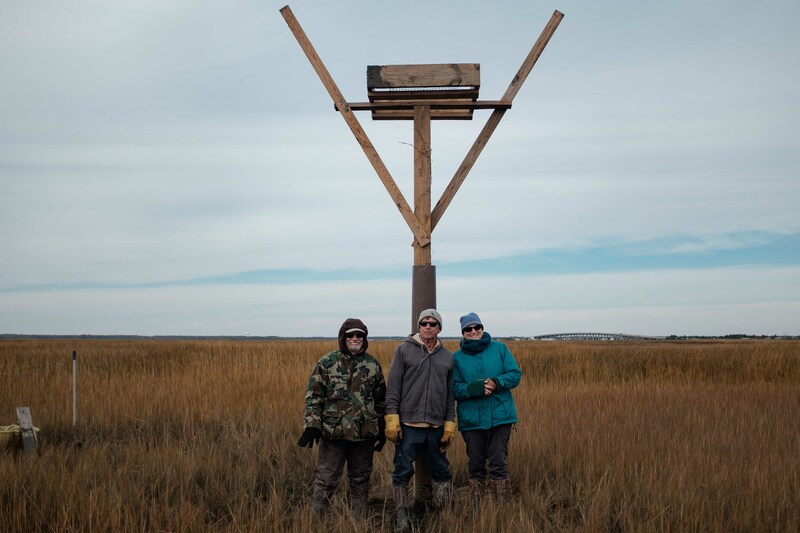 A huge shout out goes to volunteers Matt Tribulski and Wayne Russell for their dedication to ensuring that our ospreys have suitable nesting structures to return to, year after year! Thank you to everyone who donates to support this project! This entry was posted on Thursday, November 15th, 2018 at 2:27 pm	and is filed under Birds, osprey, Raptors, Volunteer Programs, Wildlife News, Wildlife Protection. You can follow any responses to this entry through the RSS 2.0 feed. Both comments and pings are currently closed. Good job!! Can’t wait for the Osprey to return.